Deep in the caverns beneath Valletta’s law courts, in the echoing warehouse of an old fish market, and twisting around the stone chambers of an exam school – The island is what the sea surrounds is an unusual exhibition. Maren Richter, its curator, is a researcher based in Austria. She specialises in sociopolitical art and public space, and I meet her on one of her curatorial tours. The project aims to be an artistic exploration of the dynamic relationship between the sea, the Maltese islands and their population. It highlights how such a small island is intertwined with the rest of the world, and the complexities of the meaning of ‘identity’. There is certainly no ‘single narrative’ in this exhibition – and purposefully so. It features works by 22 local and international artists. They explore geopolitical and historical concepts relevant to Malta, the Mediterranean, and migration. The non-Maltese artists from Austria, Egypt, France, Germany, Ghana, Palestine, Spain, Sweden, Syria, and the UK work closely with local partners. ‘The concept of perspective, I think, is something we all suffer from, especially in the wake of urban development and masterplans or in view of migrants who are forced to leave troublesome situations back home,’ Maren says. And topical issues are certainly dealt with in creative ways. 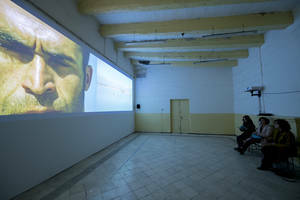 Take, for example, Tania El Khoury’s ‘Call Malta’. In this site-specific exhibition, audiences travel on traditional Maltese water taxis while listening to seashells collected from the Tunisian coastal city of Sousse. The aim is to invoke thoughts about borders and the relationship between Malta and Tunisia, all distorted through a very individual experience of the sound of the sea. Susan Philipsz’s ‘Who By Fire’, an installation in the cistern beneath Valletta’s law courts, invokes fading memories and the transience of life. It was inspired by the discovery of a bell from a warship that was damaged in the Second World War. In the dark caverns, visitors can hear the eerie sound of bells mixed with Susan’s own voice singing lyrics from Leonard Cohen’s Who By Fire. The locations of the exhibition are also important to its overall message. 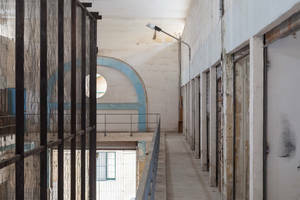 They include the underground cisterns opposite the Valletta law courts; the old fish market in Barriera Wharf (the Pixkerija); and the former St Elmo Examinations Centre, a 16th-century hospital that became a test centre and school from the 1950s. The three sites are either abandoned or in a transitional state. They are usually closed to the public – opened exclusively for these installations and workshops. They bring to light the transitions that Malta – a young nation, but one with a multi-layered history – has been through. All of them are underpinned by the shaping influence of the sea. ‘The multi-site programme invites international and Maltese artists to recast and respond to current and past urgencies and challenges, in which the Mediterranean Sea plays a significant role,’ Maren says. 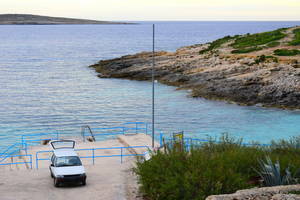 ‘The project does not try to trivialise or romanticise island life,’ Maren adds. It was important to Maren to express international realities on a Maltese stage. Ibrahim Mahama’s work for the Pixkerija, for example, explores issues of migration to Malta. The nets and meshes hung across the building invoke a range of thoughts – from trade to the environmental damage of overfishing to the recent refugee crisis which has brought countless rubber dinghies to tiny Malta loaded with refugees, fleeing Africa for the safety of Europe. In the Cultural Programme of Valletta 2018, the theme of the sea and its shaping influence on Maltese identity is central. 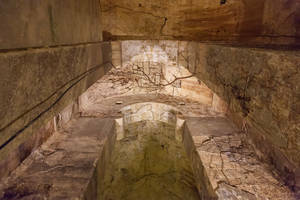 The island is not only the largest exhibition at Valletta – it is perhaps one of the deepest explorations of the city and its connections with the sea, both literally and in terms of the messages it expresses. The island is what the sea surrounds runs until 1 July. Find out more here. Andrea Rossitto is a 20 year old Bachelor of Communications with Italian student at the University of Malta. His passion towards journalism lies in the fact that this activity is a key underpinning of democracy.